Using a Shavette Razor is a bit tricky the first time. You need to be careful, but if you do this right you will probably have the closest shaving of your life. I will try to give you a guide on how to use the Shavette in the best way, and we will start with some preparations before the actual shave. The most experienced wet shavers always gives one tip to beginners: apply some shaving oil to your beard approximately five minutes before shaving. The oil serves two purposes, first it makes your beard a lot softer and secondly it also softs and protects your skin more. Remember, we are going to use a very sharp blade here, you need all the protection you can get. There is a nice Shaving Oil called The Art of Shaving – Pre Shave Oil available at Amazon. I personally like the smell of sandal wood, it is a really fresh sensation. The second one is to always apply hot water to your beard directly before you start shaving. The hotter the better, but don’t get yourself burned. Some prefer always shaving after a hot shower, but just splashing hot water to your face works fine too. The good shaving oils last through a shower, so you could still apply it before jumping in to the shower. A clean towel that you will only use in your face. Using the same towel for your hands/rest of your body is a big mistake. I would suggest getting a small towel that you use only for drying your face after shaving. Using a shavette, or any razor for that matter, will open up your pores and using a dirty towel in your face is just not a good idea. Shaving foam. The experienced guys is using old style shaving soap, but I would suggest that you as a beginner start with normal shaving foam just to get started with the shaving techniques. 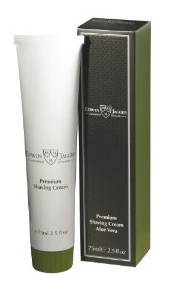 You could also get a good shaving cream, like Edwin Jagger’s Shaving Cream. A mirror. A wet shaver could not manage without a mirror. Privacy and lots of time. If this is your first time shaving with a Dovo Shavette Razor you should have at least 30 minutes that you are sure no one will disturb you. It will go a lot faster later, but the first time is always slow and getting disturbed could mean a cut in your skin. We don’t want that, so make sure you are alone. Ok, this is all you need to prepare for now. Apply the shaving foam/shaving soap/shaving cream to your face and get ready. In the next part of this series I will teach you how to use your shavette.